The 25 year old from Clara, who is now 71st in the world following his first professional win in the Portugal Masters two weeks ago, fired eight birdies at Lake Malaren to finish the day six shots behind leader Peter Hanson (64) and tied for fourth on eight under par. Hanson leads by two shots on 14 under par from Ryder Cup team mate and world No 1 McIlroy, who added a seven under 65 to his opening 67 to sit alone in second on 12 under. Sweden’s Robert Karlsson also shot 64 to sit alone in third on nine under, one better than Lowry whose brilliant effort that gives him a chance to edge closer to his goal of finishing the year inside the Top-50 in the world. “It was great,” said Lowry, who was 48th in the 78-man field after an opening 72. 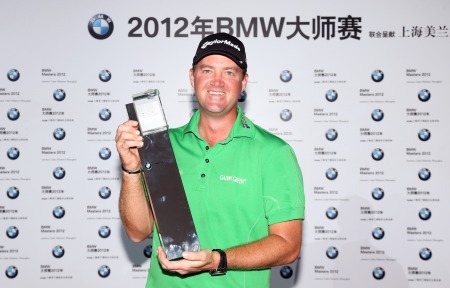 “A bogey free 64 is always nice and it to do it in a big tourament like this. I felt like I needed to shoot a good score, at least five under, to be somewhere up there going into the weekend. 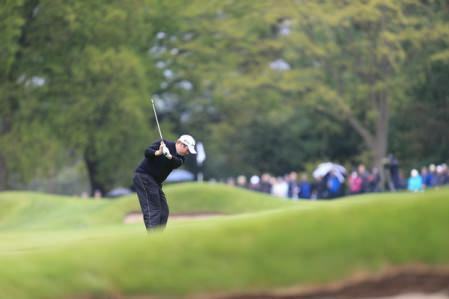 Reflecting on his level par opening round, he said: “I played lovely but had that triple on the [par-five] third hole. That knocked me back and kind of shook me a bit and I was always fighting back from there. 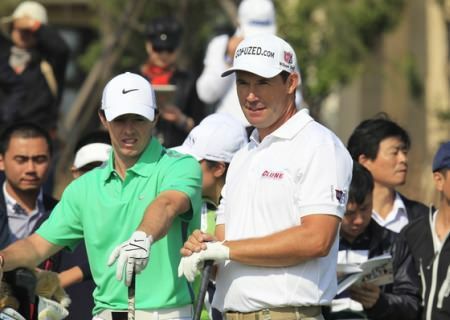 “I managed to fight back nicely and then dropped a couple of silly shots on the back nine. I reckon if I didn’t have that triple I would have shot a decent score yesterday. Lowry is tied for fourth with Justin Rose (68), Alex Noren (68) and overnight leader Jamie Donaldson, (74) and the course at Lake Malaren certainly suits his game. “Yes, it does. I tend to like these long and wide and big courses. It takes good driving and good iron play to do well around here. I feel like my driving is very good at the minute and everything else is very good as well. “I’m looking forward to the weekend. Still on a high [after winning the Portugal Masters] at Vilamoura. It was great to get my first win and as I said earlier, I did a little too much celebrating. “But there are so many tough times in golf that you have to celebrate your good times. It was good to get yesterday’s round out of the way and get out there today. “My friends meet me in the airport in Dublin and they threw a party for me in Carton House, which was very nice as well. I also met up with th Clara team. It was all a bit mental. Playing alongside McIlroy and Ryder Cup skipper Jose Maria Olazabal, Hoey bogeyed the 17th and failed to convert an eight footer at the last as he settled for a 70 that left him in an eight-way tie for eighth on seven under. Graeme McDowell had five birdies but dropped four shots in the middle of his round for a 71 that left him in the pack on four under. Ryder Cup captaincy hopefuls Paul McGinley (75) and Darren Clarke (76) could be paired together on Saturday as they finished on five over. McIlroy is not playing next week’s WGC-HSBC Champions and wants to grab his fifth win of the season to put the Race to Dubai title out of reach for the chasing bunch and complete a money list double on both sides of the Atlantic. His nearest rival, Rose, is just four behind him though third ranked Branden Grace is 12 shots off the lead after rounds of 72 and 70.